Will the Paris Deal Protect the Most Vulnerable? Coastal Arctic communities are on the front lines of climate change and oil and gas development. On the last day of the Paris Climate Summit, I sat without internet at a related Arctic symposium. The plus side was that I paid attention to the speakers rather than checking my email. The downside was that I sat in suspense, wondering if the long-awaited agreement from the international talks would be announced. I felt a bit disconnected. Although we had set up a forum for our international partners to be heard in Paris, especially on impacts of coal, the final decisions were now being made by delegates in closed-door meetings. I’m not the only one feeling disconnected. There are many voices from around the world that did not reach Paris, including my husband’s Native Village of Allakaket. In his tiny Arctic Alaska village, households lack running water, let alone internet. No one from Allakaket was invited to the Paris talks. 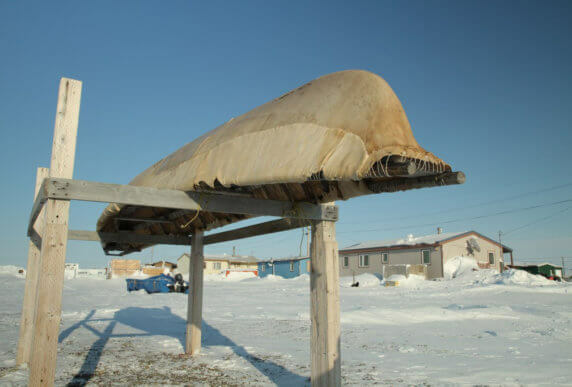 Yet like many other Alaska Native communities, Allakaket is suffering from flooding, erosion, and changes to wildlife on which villagers depend. Because of shoreline erosion and rising sea levels, a number of these villages must relocate. In the Arctic, there is no lack of challenge or irony. The region is warming at twice the rate of the rest of the planet, but many Arctic places are centers of intensive oil and gas drilling. Communities near these places have benefited from modern conveniences brought by oil revenues. Vulnerable communities from developing countries are asking the same question. There are more than seven billion of us on this planet, and we all want to live comfortably. So I raised the question at the Arctic Symposium, “Shouldn’t our governments be helping provide an alternative to oil and gas development?” I targeted the question at the State of Alaska, which has concentrated its economic development in the oil sector rather than fostering a more diversified, resilient economy. How do we provide for communities that still lack basic amenities, prepare for adaptations needed on the front lines of climate change, and move toward a sustainable economy not based on fossil fuel extraction, all while giving those who live in the region a voice in these decisions? If we from privileged backgrounds want people to put aside their dirty coal and oil, then we have a responsibility to help pay for their sustainable, responsible development—development that avoids adding to our greenhouse gas burden. The Paris Agreement takes several steps in the right direction. It sets a goal of keeping warming below 2 degrees Celsius, but recognizes the need to try to limit warming to 1.5 degrees to avoid incremental damage. Countries must submit plans every five years outlining their emissions reductions. Forest protection is encouraged as a means to absorb carbon. And this is perhaps the first of any climate agreement to recognize the need for compensation for the loss and damage that climate change causes. Developed countries are required to help developing countries pay for both adaptation and mitigation, although levels of funding are not specified. But if it stops there, the Paris Agreement will be nothing more than a feel-good declaration. It is up to us—the privileged as well as the vulnerable—to keep pushing from the bottom up. We have to hold our leaders to meaningful emissions reductions and ensure that vulnerable communities are empowered to sustainably adapt and develop. Otherwise it will not be just a few Alaska villages washing away, their culture irreparably lost, but large swaths of humanity.